The first U.S. fatality using self-driving technology took place in May when the driver of a Tesla S sports car operating the vehicle's "Autopilot" automated driving system died after a collision with a truck in Florida, federal officials said Thursday. 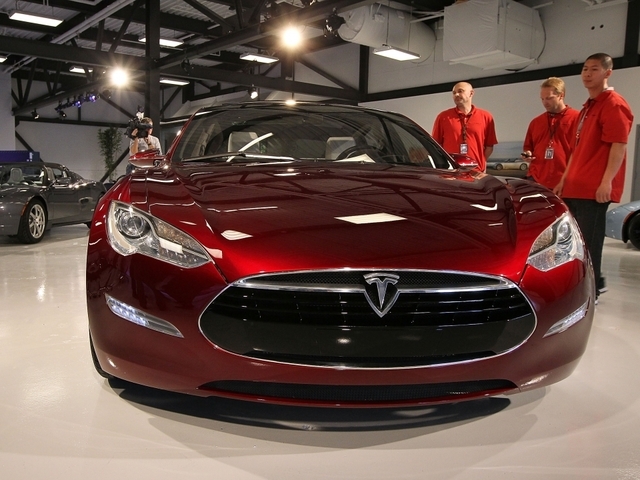 The government is investigating the design and performance of Tesla's system. Preliminary reports indicate the crash occurred when a tractor-trailer rig made a left turn in front of the Tesla at an intersection of a divided highway where there was no traffic light, the National Highway Traffic Safety Administration said. The Tesla driver died due to injuries sustained in the crash, which took place May 7 in Williston, Florida, the agency said. The city is southwest of Gainesville. Tesla said on its website that neither the driver nor the Autopilot noticed the white side of the trailer, which was perpendicular to the Model S, against the brightly lit sky, and neither applied the brakes. "The high ride height of the trailer combined with its positioning across the road and the extremely rare circumstances of the impact caused the Model S to pass under the trailer," the company said. The windshield of the Model S collided with the bottom of the trailer. By the time firefighters arrived, the wreckage of the Tesla -- with its roof sheared off completely -- was hundreds of feet from the crash site where it had come to rest in a nearby yard, assistant chief Danny Wallace of the Williston Fire Department told The Associated Press. The driver was pronounced dead, "Signal Seven" in the local firefighters' jargon, and they respectfully covered the wreckage and waited for crash investigators to arrive. Tesla conceded that the Autopilot feature is not perfect, but said in the statement that it's getting better all the time. "When used in conjunction with driver oversight, the data is unequivocal that Autopilot reduces driver workload and results in a statistically significant improvement in safety," the company said. The Tesla driver was identified as Joshua D. Brown, 40, of Canton, Ohio. He was a former Navy SEAL who owned a technology company, according an obituary posted online by the Murrysville Star in Pennsylvania. Tesla's founder, Elon Musk, expressed "our condolences for the tragic loss" in a tweet late Thursday. On May 7, 2016, Joshua Brown (40) of Canton, Ohio, was killed in a motor vehicle crash in Williston, Florida, caused by a semi tractor-trailer which crossed a divided highway and caused the fatal collision with Josh's Tesla. Josh was a master Explosive Ordinance Disposal (EOD) technician in the US Navy, an exceptional citizen, and a successful entrepreneur. He was a proud member of the Navy’s elite Naval Special Warfare Development Group (NSWDG). Most importantly, he was a loving son and brother. There has been considerable media speculation since Tesla provided the National Highway Transportation Safety Administration (NTSHA) with data indicating that the Tesla autopilot system was activated at the time of the crash. While the public's fascination with this new technology is understandable, the grief which Josh's family continues to endure is personal and private. Accordingly, the Brown family requests that all communications on this matter be directed to their attorneys Jack Landskroner and Paul Grieco of Landskroner Grieco Merriman. The investigation into the cause of this crash is ongoing. In honor of Josh's life and passion for technological advancement, the Brown family is committed to cooperating in these efforts and hopes that information learned from this tragedy will trigger further innovation which enhances the safety of everyone on the roadways. NHTSA Administrator Mark Rosekind is expected to release guidance to states next month defining the federal role in regulating the vehicles versus the state role, and suggesting what laws and regulations states might want to adopt. Federal officials and automakers say they want to avoid a patchwork of state and local laws that could hinder adoption of the technology. Most automakers are investing heavily in the technology, which is expected to become more widely available over the next five years. Like the Model S, the first generation of self-driving cars is expected to be able to travel only on highways and major well-marked roadways with a driver ready to take over. But fully self-driving vehicles are forecast to become available in the next 10 to 20 years. Musk has been bullish about Autopilot, even as Tesla warns owners the feature is not for all conditions and is not sophisticated enough for the driver to check out. Other companies have invested heavily in developing prototypes of fully self-driving cars, in which a human would be expected to have minimal involvement -- or none at all. Alphabet Inc.'s X lab has reported the most crashes of its Google self-driving cars, though it also has the most testing on public roads. In only one did the company acknowledge that its car was responsible for the crash, when a retrofitted Lexus SUV hit a public bus in Northern California on Valentine's Day.